I have yet to see this movie. I'm afraid it's going to be as bad as EXODUS: GODS & KINGS. The big problem I have is that Dwayne doesn't look like Hercules. A barbarian, yes, but not the legendary son of Zeus. The film wasn't a success so don't expect any sequels. 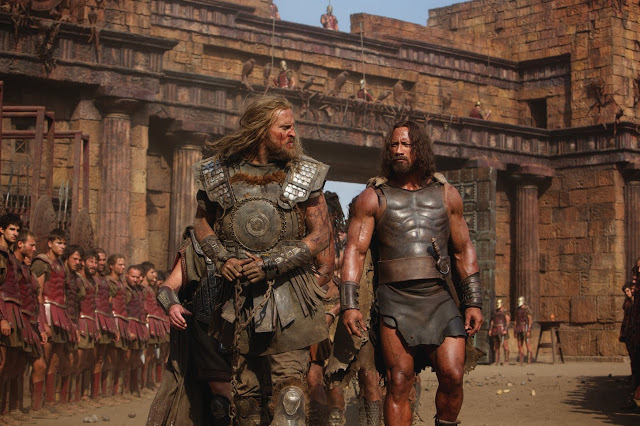 Why does Hollywood (not Italy) have such a difficult time in making a proper Hercules film? It's a true cultural blind spot. Hollywood has not been able to make consistently good Peplums since William Wyler's BEN HUR (1959). Earlier 1950s Hollywood Peplums such as QUO VADIS, THE ROBE, AND THE TEN COMMANDMENTS were really first class. However, losers during this period (and in the early 1960s) include THE SILVER CHALICE, KING OF KINGS, THE FALL OF THE ROMAN EMPIRE, and THE PRODIGAL. The last really good Peplums from Hollywood were TROY (Brad Pitt) and GLADIATOR (Russell Crowe). Just about everything since then has mess of overused GCI and very improbable plots. GODS OF EGYPT is a perfect example. "Exodus: Gods and Kings" is in my opinion deadly dull, and the so-called explanations for the miracles and curses in the Biblical tale are laughably convoluted. And, unfortunately, that actually goes for the fantasy elements in "Hercules" too. The hero's confrontations with various mythical monsters are revealed to be fakes or in some way misinterpretations or misrepresentations of what actually happened. Why make a film based on such a potent tale as "Hercules" and rob it of all its magic??? Well, I saw the movie, it is not bad, nevertheless, Dwayne certainly (despite his good intentions) is not Hercules, he looks too bulky. When you see Steve you instinctively think of Hercules, the stereotype is in our veins, he comes practically from another world, as the character (read Daniel O'Brien "Classical Masculinity and ..."). In Dwayne's movie, there are some good shots and scenes: the shot of Dwayne in the chariot, the scene in the dungeon and the wolves (chains from "Hercules"), the climactic scene with the giant statue (another borrowing from Steve's "Hercules") but, THERE ARE TOO MUCH CGI, and, as another comment said, that stinky tendency to rationalize the myths and to try to create new stereotypes. As I said, good intentions but that was not enough. Here's the link to an interesting interview with Dwayne. He also speaks about Steve. I may be in the minority but I thoroughly enjoyed the movie for what it was. Its a popcorn flick meant to entertain. It's biggest problem is that it is marketed to be a Hercules movie when in fact it is quite the opposite. Not to give anything away, but he IS NOT the son of Zeus. This is made abundantly clear throughout the entire movie. The terrible CGI you see in the trailer is literally the first 15 minutes of the film. I rolled my eyes at the beginning until the movie basically tells you it's not real. It pretty much is a giant red herring... which probably ticked off the audiences who came to see what they saw in the trailer. It is at its heart a very simple story which reminded me very much of the old Italian muscleman peplums. It breaks no new ground for fans of the genre, but I thought Dwayne was perfectly adequate for the role. He is basically a simple minded reluctant warrior who is not invincible. There is definitely hollywood action cheese (similar to lord of the rings), but anyone who enjoys Steve Reeves' Hercules should be use to it! I just strongly recommend only watching the Director's cut which is night and day. It had a bit more edge to the movie which in my opinion was handicapped drastically in the theatrical cut. All blood and gore was taken out to make it PG for families... and a few nice dialogues that flesh out the story a bit more. I found much of what it did as more of an homage to the old films. The imperfect nature of the old films is what draws me to the genre and I felt this movie had many of those characteristics. I pretty much like EVERY old Italian peplum regardless of their flaws though. So your mileage may vary!